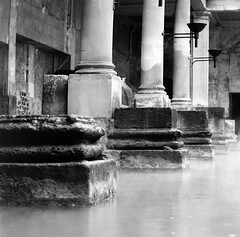 Shot at the Roman Baths in Bath in mid Jan on a very cold and wet Sunday morning. Finally got round to dev'ing the film, and scanning the negs. I am pleased that I managed to capture the mist coming off the pool.